Sustained buying activity in the index heavyweights like Reliance Industries, Infosys, TCS, ICICI Bank and oil & gas, technology and FMCG stocks pushed the key indices higher. Investors picked up beaten down frontline stocks, which led the markets to close on a strong note. High inflation has always remained a concern. But markets in today?s trade ignored a rise in food inflation and weak global cues. The broader indices were underperforming the Sensex. The BSE Midcap and BSE Smallcap down 0.06% and 0.33% respectively. 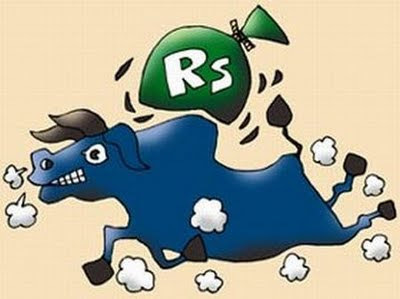 Sensex movements: Weak global cues dragged the Sensex by 24 points at 17527 in the opening trade and soon touched the day?s low of 17482 in initial trades. The index then turned green on bargain buying in frontline shares and stayed higher, hitting the day?s high of 17755 in late morning trade. The Sensex rallied 177 points to end at 17727 and the Nifty rose 42 points to close at 5320. The market breadth was in favour of declines, with 1612 shares losing, 1159 shares rising and 138 shares traded unchanged. India's second largest developer - Unitech was traded the most, with over 0.68 crore shares changing hands on the BSE, followed by world's fifth largest wrist watch manufacturer - Titan Industries (0.41 crore shares), wind turbine major - Suzlon Energy (0.35 crore shares), India's first world-class and world-size maritime shipyard - Pipavav Shipyard (0.27 crore shares) and one of the fastest growing integrated infrastructure enterprises of India - Lanco Infratech (0.26 crore shares). Ten sectoral indices closed higher, while rest three fell. BSE Consumer Durables (CD) was the top gainer, up by 4.01%, following that BSE Fast Moving Consumer Goods (FMCG) rose by 2.18% and BSE Oil & Gas surged by 1.95%. The three losers ? BSE Healthcare (HC) down by 0.53%, BSE Realty slipped by 0.36% and BSE Metal down by 0.14%. Top gainers in 'A' group pack - Jain Irrigation rose by 7.52%, Titan Industries gained by 6.83% and Videocon Industries shot up by 4.93%. Top losers in 'A' group pack - Havells India went down by 5.48%, SKS Microfinance fell by 5% and HMT lost by 3.82%. The European markets fell on Thursday after the US Federal Reserve cut its growth forecasts overnight and did not offer new stimulus measures for the world's biggest economy. The Asian indices ended mixed on Thursday. Shanghai Composite rose by 1.44%, Straits Times up by 0.06% while Nikkei down by 0.34% and Hang Seng down by 0.46%. The US stock index futures point to a lower opening on the Wall Street on Thursday.